Pepsin, an enzyme that breaks down proteins in food, is also an important factor in the formation of ulcers. 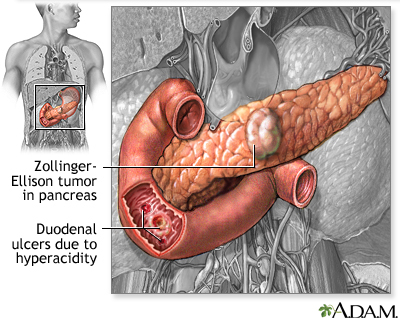 Because the stomach and duodenum are composed of protein, they are susceptible to the actions of pepsin. , which coats the stomach and duodenum, forms the first line of defense. , which the mucus layer secretes, neutralizes digestive acids. 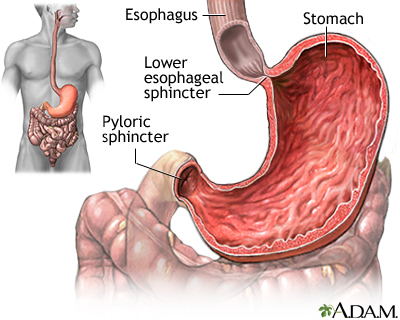 About half of patients with GERD also have dyspepsia. With GERD or other problems in the esophagus, the main symptom is usually heartburn, a burning pain that radiates up to the throat. It typically develops after meals and is relieved by antacids. 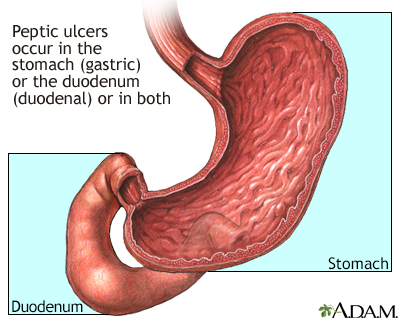 The patient may have difficulty swallowing and may experience regurgitation or acid reflux. Elderly patients with GERD are less likely to have these symptoms, but instead may have appetite loss, weight loss, anemia, vomiting, or dysphagia (difficult or painful swallowing). Chest pain, such as from angina or a heart attack, is more likely to occur with exercise and may radiate to the neck, jaw, or arms. This type of pain is often felt like a pressure or squeezing sensation and may occur together with shortness of breath, anxiety, cold sweats, and nausea. In addition, patients typically have distinct risk factors for heart disease, such as a family history, smoking, high blood pressure, obesity, or high cholesterol. The primary symptom in gallstones is a steady gripping or gnawing pain on the right side under the rib cage, which can be severe and can radiate to the upper back. Some patients experience pain behind the breastbone. The pain often occurs after a fatty or heavy meal, but gallstones almost never cause dyspepsia. IBS can cause dyspepsia, nausea and vomiting, bloating, and abdominal pain. It occurs more often in women than in men. A simple test called the carbon isotope-urea breath test (UBT) can identify up to 99% of people who have H pylori. Up to 2 weeks before the test, the patient must stop taking any antibiotics, bismuth-containing medications such as Pepto-Bismol, and proton pump inhibitors (PPIs). As part of the test, the patient swallows a special substance containing urea (a waste product the body produces as it breaks down protein) that has been treated with carbon atoms. If H pylori are present, the urease produced by bacteria will convert the urea into carbon dioxide, which is detected and recorded in the patient's exhaled breath after 10 minutes. This test can also be used to confirm that H pylori have been fully treated. Blood tests are used to measure antibodies to H pylori, and the results are available in minutes. Diagnostic accuracy is reported to be 80% to 90%. One such important test is called enzyme-linked immunosorbent assay (ELISA). An ELISA test of the urine is also showing promise for diagnosing H pylori in children. However, this test shows whether a patient has been exposed to H pylori at some point in their lives. It does not necessarily confirm an active current infection. A test to detect the genetic traces of H pylori in the feces appears to be as accurate as the breath test for initially detecting the bacteria, and for detecting recurrences after antibiotic therapy. This test can also be used to confirm that the H pylori infection has been fully treated.
. The most accurate way to identify the presence of H pylori is by taking a tissue biopsy from the lining of the stomach. The only way to do this is with endoscopy, which is an invasive procedure. However, many patients are treated for H pylori based on the 3 noninvasive tests listed above.
. Acetaminophen (Tylenol, Anacin-3) is the most common alternative to NSAIDs. It is inexpensive and generally safe. Acetaminophen poses far less of a gastrointestinal risk than NSAIDs. However, patients who take high doses of acetaminophen for long periods of time are at risk for liver damage, particularly if they drink alcohol. Acetaminophen also may pose a small risk for serious kidney complications in people who already have kidney disease. The current recommended maximum daily dose of acetaminophen is 4 grams (4,000 mg). Patients should be aware that over 600 drug products contain acetaminophen, including common over the counter cold and flu medicine. The FDA has called for manufacturers to limit the amount of acetaminophen to 325 mg per dose, tablet, or capsule in all combination products. The total maximum daily amount is 4,000 mg, but it is advised to take no more than 2000 mg daily if the patient drinks alcohol.
. Tramadol (Ultram) is a pain medication with opioid-like properties and high risk for addiction and dependence. A combination of tramadol and acetaminophen (Ultracet) provides more rapid pain relief than tramadol alone, and more long-term relief than acetaminophen alone. Besides dependence and abuse, other side effects of tramadol include constipation, nausea and itching. Magnesium compounds are available in the form of magnesium carbonate, magnesium trisilicate, and, most commonly, magnesium hydroxide (Milk of Magnesia). The major side effect of these magnesium compounds is diarrhea. Calcium carbonate (Tums, Titralac, and Alka-2) is a potent and rapid-acting antacid, but it can cause constipation. There have been rare cases of hypercalcemia (elevated levels of calcium in the blood) in people taking calcium carbonate for long periods of time. Hypercalcemia can lead to kidney failure. 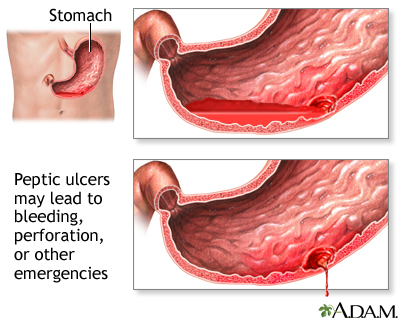 The most common side effect of antacids containing aluminum compounds (Amphojel, ALternaGEL) is constipation. Maalox and Mylanta are combinations of aluminum and magnesium, which balance the side effects of diarrhea and constipation. People who take large amounts of antacids containing aluminum may be at risk for calcium loss and osteoporosis. Long-term use also increases the risk of kidney stones. People who have recently experienced GI bleeding should not use aluminum compounds. is the most potent H2 blocker. The most common side effect is headache, which occurs in 4.7% of people who take it. Famotidine is virtually free from drug interactions, but it may have significant adverse effects in patients with kidney problems. has few side effects. However, about 1% of people taking it experience mild temporary diarrhea, dizziness, rash, or headache. Cimetidine interacts with a number of commonly used medications, including phenytoin, theophylline, and warfarin. Long-term use of excessive doses (more than 3 grams a day) may cause erectile dysfunction or breast enlargement in men. These problems go away after the drug is stopped. interacts with very few drugs. Ranitidine may provide more pain relief than cimetidine in people younger than age 60, but there doesn't seem to be a difference in older patients. A common side effect of ranitidine is headache, which occurs in about 3% of people who take it. has few drug interactions. Side effects of nizatidine include headache and dizziness.
. This is more likely with ranitidine than with the other H2 blockers, but it is rare with any of these drugs. Kidney-related central nervous system complications. Famotidine is removed by the body primarily by the kidney. This can pose a danger in people with kidney problems. Use of the drug in people with impaired kidney function can affect the central nervous system and may result in anxiety, depression, insomnia or drowsiness, and mental disturbances. As a result, people with kidney failure should reduce the dose and increase the time between doses. Some experts are concerned that the use of acid-blocking drugs may increase the risk for serious complications by masking ulcer symptoms. , which indicate a higher or lower risk of rebleeding. 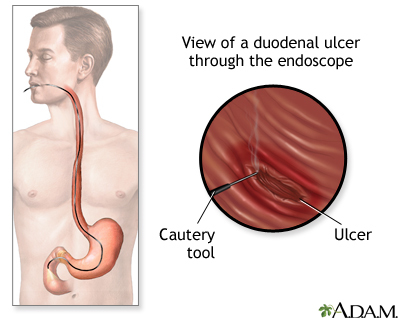 A diet that is rich in fiber may cut the risk of developing ulcers in half and speed the healing of existing ulcers. Fiber found in fruits and vegetables is particularly protective. Vitamin A contained in many of these foods may increase the benefit. Milk encourages the production of acid in the stomach, although moderate amounts (2 to 3 cups a day) appear to do no harm. Certain probiotics, which are "good" bacteria added to yogurt and other fermented milk drinks, may protect the gastrointestinal system. Coffee (both caffeinated and decaffeinated), soft drinks, and fruit juices with citric acid increase stomach acid production. Although no studies have proven that any of these drinks contribute to ulcers, consuming more than 3 cups of coffee per day may increase susceptibility to H pylori infection. Studies conducted on spices and peppers have yielded conflicting results. The rule of thumb is to use these substances moderately, and to avoid them if they irritate the stomach. Some studies suggest that large amounts of garlic may have some protective properties against stomach cancer, although one study concluded that garlic offered no benefits against H pylori and, in large amounts, can cause considerable GI distress. Studies from Spain have shown that phenolic compounds in virgin olive oil may be effective against eight strains of H pylori, three of which are antibiotic-resistant. Although no vitamins have been shown to protect against ulcers, H pylori appear to impair the absorption of vitamin C, which may play a role in the higher risk of stomach cancer. 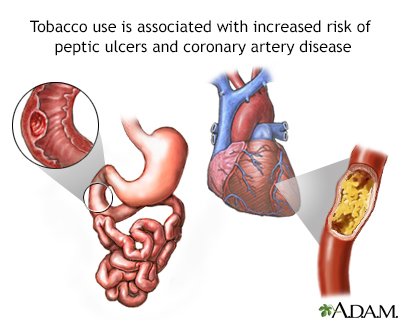 Tobacco and alcohol use prevent ulcers from healing. Avoiding alcohol (or consuming in low to moderate levels) and quitting smoking can help increase the benefits of therapies and prevent ulcers from forming.